Why is it more important to detail your car in the winter months? During the winter months here in Utah many of us have the mentality to think its not worth it to have our cars washed or detailed because it will just get dirty the next time we drive it. While this, in many cases is true, there are many reasons that it is very important to make sure we clean and protect our vehicles all winter long. If not, it may be something we regret come springtime. Here are the top 10 reasons why you need to detail your car in the winter. For almost all of us our car is dirtier in the winter than in the warmer months. This not only is gross but its ugly too. While it may not be the most important reason for you to detail your car in the winter, it definitely is a concern for those who have nicer vehicles. If you are someone who needs to impress clients or have an important meeting what better way to do it then showing up in a freshly detailed vehicle in the middle of winter. 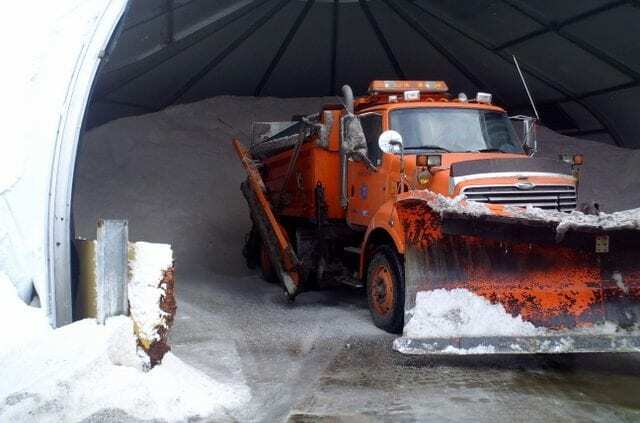 Snow plow loads road salt in Utah. As mentioned above the winter is really hard on your vehicle. This means you should be doing everything you can to protect your vehicle. Both interior and exterior surfaces are needing extra care and attention to help them endure the constant attacks from the environment. We offer exterior, waxes, sealants and even ceramic coatings to protect paint all year round but especially during the winter months. During the Utah winter it is impossible to avoid getting snow, ice and road grime on your vehicle. Now modern vehicles are made to withstand some of “the elements” but they are not invincible to them. The longer we let these things sit on our cars the more potential there is for damage such as scratching, corrosion and cracking. The most common type of damage is scratches in the paint. As snow and ice slide around on the surface of a vehicle with embedded dirt within, it will cause damage. This also occurs as we “brush” snow off our cars. Unfortunately sometimes this type of scratching is inevitable but the more carefully it is done the more chances we have that we are not harming the paint. I have seen instances where people have literally gouged the paint with the ice scraper. Please do not use the ice scraper for paint. It is intended for windows only. It can also help to warm the car before starting to clean off the snow and ice to help melt and loosen up some of the ice and snow. Also having a ceramic coating install will help to minimize this issue as these types of coating are much more scratch resistant than vehicle paint. Ceramic coatings also make it harder for things to stick to or sit on the surface which makes it easier to clean. One of the most important things you need while driving and operating a vehicle is to be able to see. One thing that drives me crazy and makes me angry is when I see drivers that have not cleaned the snow and ice off their windows and have only cleared a part of the windshield directly in front of the driver’s seat. This is not only a safety issue but in many states you can be fined for not cleaning the snow and ice off your car. The issue is not with snow and ice but all the salt and road grime that builds up on the windows as well. If the windows are not washed and cleaned frequently throughout the winter it will potentially become a visual impairment problem. Ice build up can be the cause of accidents if its built up in a bad place. Ice build up can happen on almost any part of the car. I’ve seen it build up on the door handles, wiper blades, side view mirrors and even backup cameras. If ice builds up in cracks or seals between panels or doors it can potentially lead to cracks or damage to the paint and other surfaces. Makes sure if there is a lot of temperature fluctuations during the days where snow and ice melt and refreeze over night that water is not pooling up or getting stuck in those areas. If it does and causes damage it can lead to much bigger issues such and paint peeling, leaks into the interior or even engine problems, etc. While most people realize that excessive ice and snow on their vehicle is a potential safety hazard for them, they don’t think about the snow and ice that can fall or even “fly” off their vehicle while they are driving and cause safety issues for other drivers. I have seen it many times when an individual does not clean off their car and the snow flies off in big chunks and hits other cars. Especially on turns or when driving down the freeway. I have never seen this cause an accident but I have seen it cause temporary road blindness. I have also heard of many times where ice has actually flown into another’s window and cracked or even broken the window completely. Check out this video from YouTube. This really shows exactly what I’m talking about. I know of a few incidences where similar situations have actually caused fatalities. I’m sure none of us want to be involved in this, so please keep your car as ice and snow free as possible. As many of us know when a vehicle is dirty that’s all we see. Is the dirt and grime built up all over the surface and on windows of the vehicle. Another problem with this is that we cannot see, at least not very well, the actual surfaces of our vehicles. If we cannot see it, then how could we identify a problem if it is there. For example; if there are rust spots beginning to form or if there is a new rock chip in the windshield. We cannot address the issue and get it taken care of unless we can see it and actually know its there. Not seeing and then not taking care of these issue while they are small can lead to bigger and more expensive issues later on down the road. It’s important that we don’t let our vehicles sit dirty too long so we do not miss these small problems. As the winter progresses, if we are neglecting the interiors of our vehicles we may not realize how much moisture is accumulating inside. We don’t think much about it but we step in and out of our cars with wet and icy shoes and boots and make small deposits of water and filth over and over. If this issue is not addressed it may result in mold, mildew and bacteria growth in the cracks, crevasses and under the floor mats where the water gets trapped and cannot evaporate easily. This is obviously not healthy and this can cause some funky odors, especially when temperatures warm up. Driving a clean car makes us happier. A study led by associate professor Nicole R. Keith, Ph.D., research scientist and professor at Indiana University, found that people with clean houses are healthier than people with messy houses. Participants who kept their homes clean were healthier and more active than those who didn’t. I believe this conclusion can be applied to those with clean vehicles versus dirty vehicles as well. I know that I feel better when my “spaces” are clean and organized. A dirty vehicle does not just mean clutter and junk but it means germs, bacteria and viruses. This puts cleanliness and organization in a whole different perspective. Along with the dirty inversion air and cold temperatures, we don’t need anything else to contribute to our struggles with staying healthy in the winter. Overall, there are many reasons why it is important to keep your vehicles clean and detailed throughout the year but especially in the winter months. I have been detailing for about 12 years and have seen what happens when vehicles are neglected and when they are taken care of and well maintained. It is amazing how quickly a car can begin to have issues and “fall apart” due to the many things that are constantly “attacking” almost every part of a vehicle. If you want to keep your vehicle in tip top shape we can help maintain and protect it. Chris Blaisdell is the owner of Onsite Detail and has been detailing for 12 + years. International Detailing Association. The industry leader in detailing standards. This is a good article. I think protection is key in the winter months, especially where its so harsh like Utah. Even in mild winters it can destroy cars. I’m glad I don’t live where there is snow! I hate cold and so does my car. Adding your ideas to my car care will help. I’m sure. Thanks. Go winter! Thanks for destroying cars. Its so hard to keep things clean but this post is on point. Yes! Finally someone says what I tell people all the time. Wash your car MORE in the winter. Thanks for fantastic information I was searching for this info for my friend.